Lab Supply is proud to provide our customers with top quality feed from LabDiet. This guinea pig feed is specially formulated to help guinea pigs in many areas. 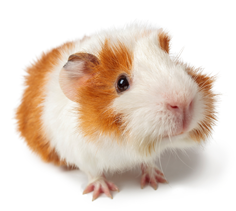 This feed can help maintain reproduction, lactation, growth and many other areas of health in guinea pigs. This feed is cost effective in the long run because it does not require any supplemental greens to support the health of guinea pigs. This feed has also been researched to prevent stillbirths, pregnancy toxemia, and tissue calcification. This feed is made from high quality ingredients and is filled with nutrients so you can know that your guinea pigs are getting the best feed for their health. If you would like more information on LabDiet 5025 Guinea Pig, then please click here to view the product PDF. Here at Lab Supply, we are committed to making sure you find exactly what you need. If you have any questions about this feed or any other products we offer, than please click here to visit our contact page. We will be more than happy to answer any questions you may have.